The Russian Navy has commissioned the long-delayed Admiral Gorshkov, lead ship of the Admiral Gorshkov-class (Project 22350) of guided missile frigates, on July 28 during a ceremony at the Severnaya Verf shipyards in St. Petersburg, a day before the service’s traditional grand naval parade. The new warship is expected to be deployed with the Russian Navy Northern Fleet’s 43rd Missile Ship Division. The 5,400-ton Admiral Gorshkov is the largest surface combatant to be built by Russia since the collapse of the Soviet Union. According to Russian Vice Admiral Viktor Bursuk, the Russian Navy will operate four Admiral Gorshkov-class frigates. The first-of-class Admiral Gorshkov has been under construction for over a decade. The ship was laid down in 2006 and launched in 2010. It has been undergoing builder sea trials since November 2014. The final round of sea trials commenced in last March. Initially, the ship was expected to be commissioned in November 2016. However, due to various delays that date had to be pushed back to November 2017. That deadline also passed. (…) It is a multi-purpose platform designed for anti-air, anti-surface, and anti-submarine warfare missions. It remains uncertain whether the problems with the Polimut Redut air defense missile system have now been solved. Additional armaments include an RPK-9 anti-submarine rocket launcher, two 3M89 Palash close-in weapon systems, and an A-192 130-millimeter naval gun. The ship can also accommodate a Ka-27PL anti-submarine helicopter. The ship, powered by a combined diesel and gas turbine engine, can reach top speeds of up to 30 knots. Notably, the delivery of the second Admiral Gorshkov-class guided missile frigate, Admiral Kasatonov, will be delayed by around eight months. The ship is expected to be delivered to the Russian Navy by November 2019. Two additional Project 22350 frigates have been laid down in 2012 and 2013. “However, given that the Russian defense industry is still struggling with designing a new propulsion system for the Russian Navy’s surface combatants as it can no longer rely on Ukraine-made gas turbine engines (it still had two Ukrainian engines for Gorshkov-class destroyers in stock), it is unclear when or if either of the two ships will enter service,” I explained in early July. 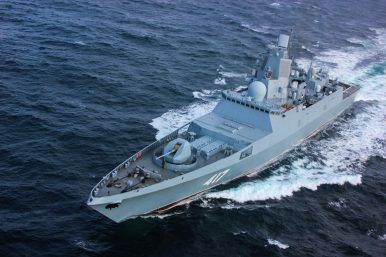 It is worthwhile to reemphasize that while the Admiral Gorshkov has now been commissioned, it is far from clear whether the ship’s manifold technical issues, including repeated problems with its propulsion and air defense systems, among others, have been fixed.